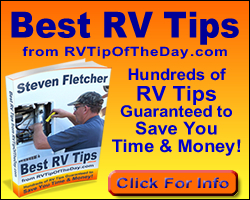 If you own or spend time in a recreational vehicle (RV) or boat, you know of the odor problems coming from the holding tanks used for sewage (grey and black water tanks) and chemical toilet waste. There are a number of products available to control these odors, but some of these products may contain chemicals that are banned and cannot be sold or used in RV chemical toilets in California. Many chemicals are banned in these products, but formaldehyde, which is commonly used to reduce odor, in particular, has come to the attention of the California Department of Toxic Substances Control (DTSC). Based on chemical information, formaldehyde may be a non-biodegradable toxic chemical substance and you hould avoid purchasing and using any chemical toilet product that lists formaldehyde as an ingredient in any concentration. Chemical toilet products may contain chemicals that are known to cause septic tank failures by killing the bacteria essential to the treatment process in the septic tank. In 1979, the Prohibited Chemical Toilet Additives law was passed and it banned the manufacture, sale and use in California of non-biodegradable toxic chemicals in chemical toilets or waste facilities (toilets). This law was expanded in 1988 to include a similar ban on the sale and use of halocarbons in products used to clean or unclog a sewage disposal system. Chemical toilet additives include chemicals that are known to cause septic tank failures by killing the bacteria essential to the treatment process in the septic tank. Formaldehyde can cause these bacteria to die in holding tanks as it controls odor by killing bacteria. Formaldehyde also kills bacteria necessary to breakdown the wastes to decompose in septic tanks. When your holding tank wastes are disposed into a "dump station" at a campground or RV park (i.e., usually to a septic system), the formaldehyde may kill the bacteria in the septic tank which can eventually clog the system. When a septic system fails, sewage wastes does not breakdown and can cause an increased risk to people from contact with raw sewage. Use holding tank deodorizers that Do Not Contain Formaldehyde, and look for Biodegradable (enzyme or citrus-based) products instead. Minimize your use of holding tank deodorizers by using toilet facilities at rest stops when you can. Follow the directions for toilet additives and add only what is recommended. Tell other RVers and boaters about what's safe and legal to use in their toilets. These chemicals have not been evaluated by DTSC, but based on their potential impact to dump stations should be avoided in holding tank deodorizers. Note from Steven & Fran: The above is offered here as information only because it is a government publication. We do not endorse or necessarily agree with it. Careful reading of the Advisory' shows that formaldehyde has not been studied for it's affect on septic systems and is not one of the banned products. We have read conflicting evidence that formaldehyde does not adversely effect septic systems.